Columbus-ite Thomas Adams was an expert in the tire business. Between doing global product development, selling for a large account on the east coast, and working as head of marketing for the U.S. branch of a global tire company, it’s safe to say that he had found a comfortable niche. However, after 30 years in the industry, the cracks were beginning to show. “The last two or three years, every 8 weeks I was in China,” Said Adams. “I loved the people, but it’s rough…my health was starting to suffer, and quality of life was just tough.” After 30 years, Adams was ready to take on a new venture. After leaving the tire industry, Adams found himself having a light-bulb moment while working in soup kitchens in Philadelphia. He realized that he could culminate his interests in fresh food and asset based community development by running a gourmet food truck. 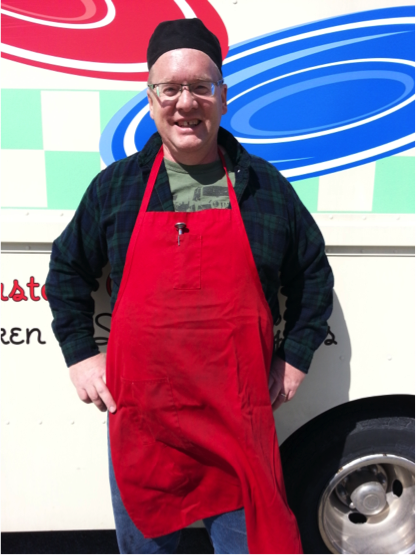 Adams started his food truck endeavor Red Plate Blue Plate with a used Utilimaster van. After a bumpy start (his first test-drive led to his engine catching ablaze), Adams worked out the kinks and settled into serving Charleston-inspired southern coastal style of cuisine. “Kind of where the garden and the shore meet in the Carolinas, down to Georgia” Adams says. Through an internet search for commissary kitchens, Adams found an ally in the ECDI powered Food Fort-a food business incubator featuring a licensed commissary and a full sized commercial kitchen. It provides him with many resources. “I was on gravel before. I have sanitation here, I have an inside sink, I have a prep area. I don’t have to do absolutely everything on the truck which is what I had to do last year,” Adams noted. Adams also discovered that his personal philosophy aligned with that of the Food Fort. “The heart of ECDI is economic-based community development, so I have an instant alignment here,” he said. Adams has big ideas driven by asset-based community development- a technique Thomas learned at his church, Sanctuary of Columbus. Asset-based community development helps communities empower themselves by taking inventory of the strengths and assets they possess. One such idea is Red Plate Blue Plate’s alter ego, Abe’s Kitchen. “[Abe’s Kitchen] owns this thing called a H.E.A.T. menu: Healthy, Economical, and Tasty. Imagine a dollar menu, like one dollar, two dollar, four dollars. And one dollar gets you a nice, healthy, high value sandwich. Two dollars gets you a sandwich and a side. Four dollars and you’re carrying dinner home” Adams explained. Driven by food and time donated by the community it’s serving in, Abe’s Kitchen would be an example of the effectiveness of asset based community development. Red Plate Blue Plate maintains an updated calendar at streetfoodfinder.com. In the future, they hope to develop partnerships with the burgeoning growler and brewpub industry in the University District. For questions and booking, Thomas Adams can be contacted at or (614) 859-0809.